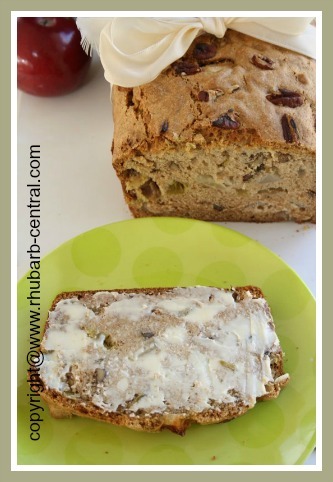 This "easy to make at home" Rhubarb Apple Bread Recipe is both healthy and delicious! 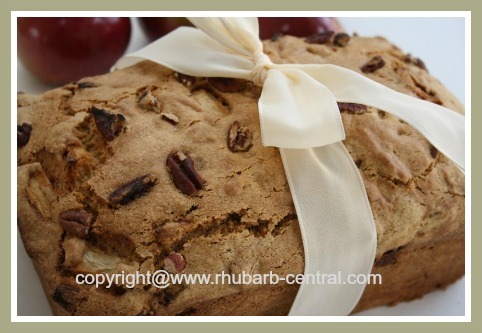 If you have been looking for a scrumptious recipe for rhubarb bread to make with FRESH or rhubarb from your FREEZER, you have found a choice recipe here! 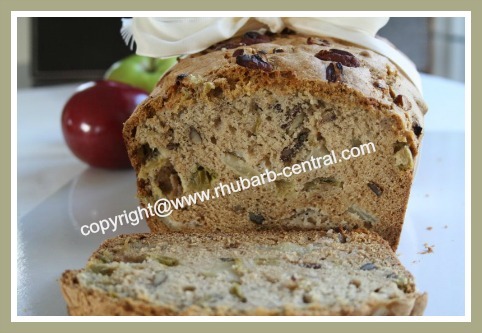 If you wrap this loaf, or store it in an air-tight container, it will keep fresh and moist in the refrigerator for up to one week or more! Great alternative to muffins for the lunches! 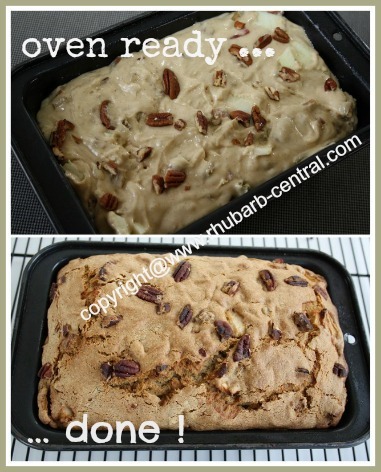 Note - if you are using freezer rhubarb for this recipe, thaw it first, in a sieve, over a bowl, and discard the excess liquid. In a bowl, combine the rhubarb and the apples. In another bowl, combine the flour, baking soda, salt, cinnamon, baking powder, and nuts. In another bowl beat, using an electric hand mixer, the eggs, and mix in the sugar, oil, and vanilla. Gently fold the flour mixture into the egg mixture, mixing just until combined, do not over-mix. The batter will be quite thick, this is normal. Fold in the rhubarb and apples. Pour into 1 medium size (approx. 9" x 5" x 3") greased loaf pan, or two smaller size pans. (I used one medium size pan). Bake at 350° F for 50 to 60 minutes, or until a toothpick inserted in the center comes out clean. 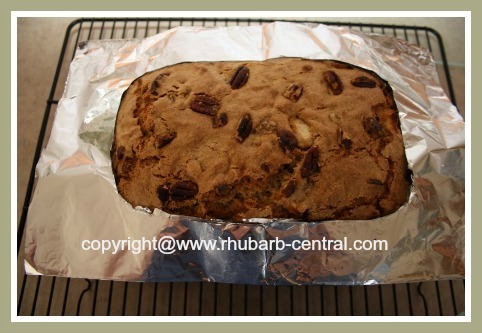 After the rhubarb apple bread has baked for about 30 minutes I like to add a shield made out of aluminum foil paper to protect the edges of the bread from becoming too dark (see image below). This is similar to the pie crust shield protector idea. Allow to cool on rack before slicing. ENJOY this bread plain, or with butter! 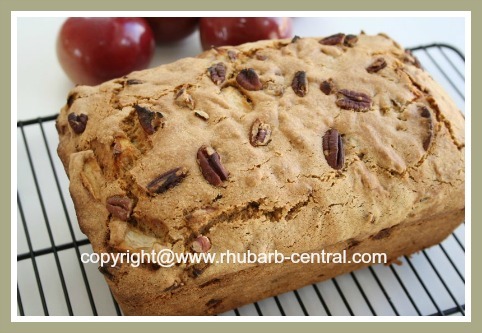 Rhubarb muffins provide much of the same texture and taste as rhubarb bread.